Congratulation to the CNN correspondent, Phil Mattingly and his wife, Chelsea Carter for expecting their first child. The couple married on December 10, 2011, and the beautiful husband-wife duo is going be the parents for the first time. Let us discuss the relationship of the couple here. Phil Mattingly And Chelsea Carter-The Couple: Is Expecting Their First Child? Even though he is a confidential person, he could not stop himself to share the biggest news of his life with the audiences as he and his gorgeous wife Chelsea Carter is expecting a baby. The happily married couple has every reason to celebrates their blessed family life. The couple has been married since December 2011. On 1st March 2017, Phil replied to the tweet of Diane King Hall mentioning that his wife is pregnant and are expecting their little one. The couple is surely very happy but still have not disclosed any information besides the reply. Soon they are going to complete their family after welcoming their first child. "Phil and Chelsea are parents to their new son Cardar...He was born just this morning...Phil tells us that everyone is doing well and we CNN send them our best wishes." It seems like Mattingly is enjoying his fatherhood and though the couple is very private, Phil frequently tweets about his son. All the best wishes to the beautiful family. Phil Mattingly married his longtime girlfriend, Chelsea on 10th December 2011 in a private ceremony. Both of them are very conscious and confidential when it comes to their personal life. Since there are no rumors of any conflict, divorce, or affairs between the couple we can assume that they are living a happy life together. Phil started his career working as a reporter at the initial phase. 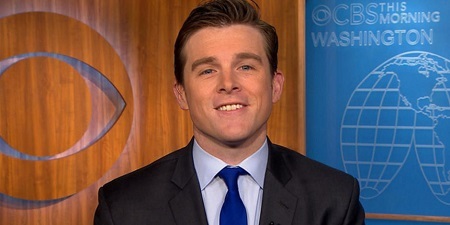 He joined Bloomberg News in Washington and began working there as a reporter. He helped in the coverage of the federal response to the financial crisis. Working in News for several months, he was then shifted to Bloomberg Television and served as a national political correspondent. While working with Bloomberg TV, he covered all the important presidential candidates of the national and international policy under the Obama administration. Apart from this, he also severed the network's White House as a correspondent where he made several break news about the administration's foreign, legal, economic policies. Moreover, he also became the first to interview the former Attorney General Eric Holder. Besides all these, his career turned after joining CNN in December 2015 as a correspondent of New York. Since then to till today, he is serving for the CNN as being the Washington DC Bureau's correspondent. Born in the United States on December 16. He is an American and belongs to white ethnicity. In 2006, he graduated from Ohio State University. He was a scholar varsity athlete. In 2008, earned a Master's degree in journalism from Boston University. He was a writer for the Bloomberg Businessweek magazine. He received a Society of American Business Editors and Writers award for the breaking news. He also covered Congress's financial policy and economics. He was a finalist for the Scripps Howard Distinguished Service to the First Amendment award for investigating Barack Obama's administration crackdown. He joined CNN in 2015 as a correspondent. He has around 64.4k followers on Twitter.